Much of the vibrant history as well as diversity of the genre of protest music is unknown today, including among practitioners or activists who compose and perform protest songs. There are several reasons why we might be interested in the genre of protest music as an expression of politics, especially left politics, in the context of country such as India. The first one arises out of stereotypes that have been seen to exist, certainly in more recent decades in India, of protest music having typically standardized structures - for example, sounding agitational and mobilisational, conveying political messages stridently, through lyrics, tunes and well as tempo, mostly being sung by a collective- and for this reason perhaps not being good enough music ‘on its own terms’. As a result, the genre of protest music is associated very often with stereotypical forms and styles of rendering, very often encompassing a limited range of styles or types of lyrics. This stereotype has often resulted in activist musicians as well as political formations not considering songs as protest songs unless they conformed to the standardized stereotype with respect to form and content on the one hand and non-activist musicians dismissing protest music as ‘mere sloganeering’ on the other. However, it is possible understand protest music as being a highly varied and historically evolved kind of music and to engage with the stereotypical protest song as being a particular type within the larger genre. It is possible to argue for the legitimacy of protest music as music meriting analysis on its own terms, as music. The second reason for trying to understand protest music comes from looking at music as social text, with the structure and grammar of music providing us with inferences about contexts of its creation. Especially in societies where most music is not written down or notated formally, even when music created with an explicit social purpose, like protest music, the objectives of creating and the nuances of particular forms used have to be understood from the music itself. Songs themselves act as a text from which it is possible, along with anecdotes and stories around their creation and performance, to read back into historical events as well as fascinating debates. In this sense, the ‘aural archive’, especially in the absence of formal documentation, serves as a rich corpus of concepts that allow us to understand, in this case, the relationship between music and politics. Third, analysis of the protest music tradition allows us to understand it in the context of radical leftwing politics from the first half of the twentieth century, when the relationship between aesthetics and politics was debated vigorously in different parts of the world. As part of this, the distinct role that music can play as an art form, as a vehicle through which questions of artistic representation can be addressed, were written about and experimented with in different parts of the world, including in India beginning from the late colonial period. It thus helps us understand the debates and questions that came up in crucial periods in the cultural history of the country. Fourth, protest music in the period from the beginning of the twentieth century had an interesting relationship with notions of ‘popular culture’ as the idea of the popular was played out in interesting ways in the context of early twentieth century modernity and in the formative years of the Indian nation. Not only did the conception of what constituted protest music require an interrogation and explication of the music of the ‘popular classes’ in a Gramscian sense, but the protest music tradition significantly impacted the commercial arena, in this sense playing a role in shaping commercial mainstream culture, even if it was produced often in ideological opposition to it. Political expression through music has historically seen the adoption of extremely diverse forms across cultures, because of which it is difficult to arrive at a simple set of principles that constitute the category of protest music. This article goes through some of the discussions that informed perceptions about what protest music was about in the tradition of an important Indian organization, the Indian People’s Theatre Association. It also presents a synoptic view of the protest song tradition in the USA through the twentieth century and that of the South African tradition through Apartheid. Through these examples, we will attempt to raise some of the broad concerns of protest music from different parts of the world and across different periods in history. The first issue that comes up is: What is protest music? In the broadest sense, protest music expresses discontent with perceived problems in society, covering a wide variety of issues and concerns ranging from personal and interpersonal to local and global matters. The oldest European protest song that that has been documented and details available is "The Cutty Wren" from the English peasants' revolt of 1381 against feudal oppression. In India, there have been a range of musical traditions, exemplified by the Sufi-Bhakti traditions, where music was used to comment upon and critique social practices. In the Western Classical Music tradition, there are innumerable examples of composers expressing their protest through compositions, such as Benjamin Britten's "Pacifist March" in 1937 and "War Requiem" in 1962, which expressed the futility of war. The works of Beethoven and Mozart have been seen to express revolutionary themes. Some of the most internationally famous examples of protest songs come from the United States. They include "We Shall Overcome" (a song popular in the labor movement and later the Civil rights movement), Bob Dylan's "Blowin' in the Wind and Marvin Gaye's "What's Going On". Many key figures world-wide have contributed to their own nations' traditions of protest music, such as Victor Jara in Chile, Silvio Rodríguez in Cuba and Miriam Makeba in anti-apartheid South Africa. If music has been used to convey protest, in what ways does it do so? Several sets of issues have been important in the creation of protest music. First, how can music be "political", or what constitutes political expression in music? Can music be political without text? Can music be political without relying on the explicit meaning of words? Second, what are the kinds of music that need to be represented in a radical political movement? Is it the myriad traditional or indigenous musical forms, the folk music of the hundreds of social groups, the tribes, the itinerant wandering singers? How can the existing corpus of ‘old’ or traditional music be interpreted, used or rejected in terms of its ability to reflect lives of ordinary people and represent their problems? How should the longstanding classical music tradition be assessed/considered as a benchmark? How can ‘modern’ or ‘western’ forms of music can be used to represent the people and depict/articulate resistance? Third, is the formal structure of music important to consider when we analyse political or protest music? Given the above range, should people’s music be spontaneous and faithfully represented or consciously crafted out of whatever forms are considered appropriate and through newer forms? When spontaneous music emerges that reflects the lives of ordinary people, how should it be assessed? What is the distinction between progressive and reactionary music, is it about lyrics or form? Is experimentation with the grammar of the music part of the articulation of protest, ie., what are the innovations with the nature of the sounds produced, the use of voice, pitch, harmony, orchestration, instruments and so on? In other words, to what extent does the range of music that was created reflect the need for expression through the physical content of the music itself or the politics that it seeks to convey? In the history of protest music in different parts of the world, it has been seen that the message of protest was manifest in the form and structure of the music as well as in the message sought to be conveyed. Hugh Masekela, one of South Africa’s greatest Jazz musicians who played a key role in the anti-apartheid struggle, once said in an interview to Reuters, "If you are concerned about what's going on around you, you will talk about it in whatever format". As a result, there have been great debates and also tremendous variety about how the message of protest can best be expressed through music. The American protest song tradition through the nineteenth and twentieth centuries drew heavily from the existing folk music tradition of North America, from the Choral hymn singing tradition and the African indigenous music of black communities. Using relatively simple tunes and lyrics, music around the Great Depression, the two World Wars, the Labour Movement and so on drew attention to major events in history as well as their impact on common people quite starkly and directly. Over the twentieth century, there also came into existence the tradition of Jazz, the genre of music that originated in Black communities in North America as a confluence of African and European music traditions. Jazz very often explored the theme of racial inequality and became a major mode of expression for musicians not only in America but also in apartheid South Africa, which also came to evelve its own Jazz tradition. In all these, there was a distinct break with ‘pure’ traditions of different types, whether classical or indigenous. Hoping to reach a wider audience, Meeropol set his poem to music, and the song "Strange Fruit" was first performed at a New York City Teachers Union meeting. It created an immediate stir. Meeropol sang it himself, but as "Strange Fruit" grew in popularity, his wife began to perform the song. In India, the formation of the Indian People’s Theatre Association in 1943 marked a formal adoption of the idea that music and theatre would be used for the conscious articulation of protest by the left movement. The setting up of the IPTA and other such formations, like the Praja Natya Mandali in Andhra Pradesh and the Kerala Paople’s Arts Club in Kerala was a response to a perceived need for new aesthetic forms that represented the people while distinguishing themselves from the cultural traditions of the mainstream nationalist movement on the one hand and commercial theatre on the other. This ‘people’s art and theatre’ attempted to reflect and respond to the travails of a colonized nation on the one hand and the specifics of the multilayered oppression of the common people under both the colonial and the immediate post-colonial contexts.In India, this may be said to be the first or one of the early attempts to use music, dance, theatre and art for the systematic articulation of protest against oppression, particularly that based on class, although protest music was composed and performed widely before that. As part of using music for protest in a formal manner, it was considered necessary to use “old art forms with new and vibrant themes, all that is best in our folk arts and in the spirit of our people” and this was reflected in an extensive use of the classical and folk tradition for the “defence of our culture against imperialism and fascism”. It was also emphasized that the productions should be simple and direct so that the “masses can easily appreciate and understand and also participate in the creation and production of these”. The varied interpretation of what might be ‘new and vibrant’, ‘simple and direct’, ‘reflect an anti-imperialist and anti-fascist sentiment’, ‘be accessible to the masses’ and so on generated great diversity in the IPTA’s musical repertoire, which consists of folk songs, classical music based songs, translations/ adaptations of songs from the International Communist and Anti-Fascist Movements and songs belonging to the Western Harmonic Tradition. For example, the repertoire contains a large number of songs where folk tunes such as the Bhatiali in Bengal or the Heer in Punjab have been directly used, viz. in songs written and sung by Hemanga Biswas, Nirmalendu Chowdhury, Sheila Bhatia, to give examples. Within the folk genre we can find another category of songs that can be classified as ‘native’, where direct protest themes are inserted into commonly used tunes that can be used flexibly and satirically. Examples of this are ‘Raghupati Raghava Mountbatten’ written by Hemanga Biswas, composed in a ‘kirtan’ style; Gaajan singing about the Bengal famine and a large number of songs using the ‘Aalha’ or ‘Sapri’ from U.P. or the ‘Vallamkali’ or boatmen’s songs in Malayalam. These ‘native’ songs were theatrical and simple in terms of tunes – able to accommodate all kinds of lyrics. This form of music continues to be part of the repertoire of groups attempting to convey a political message. In Bengal and in Bombay that the IPTA repertoire saw the significant emergence of Hindustani classical music based songs as a conscious contribution to the cultural movement. With classically trained musicians like Ravi Shankar and Jyotirindra Moitra as important members of the IPTA, a large number of songs had complex classical tunes. These songs, mostly chorus songs with solo voices singing small parts, involved complex tunes, modes of rendering and orchestration. Jyotirindra Moitra’s ‘Nabajeebaner Gaan’ and Ravi Shankar’s ‘Jaaga Desh Hamara’ are examples. These are songs that are rooted in the Indian classical tradition with uplifting tunes, sung at high scales and tempos to the accompaniment of large orchestras using instruments like the sitar, veena, violin, tabla and the bugle. Most of these songs were openly mobilizational, exhorting people to rise up against colonialism and oppression. Finally, there were a large number of songs, mostly in Bengali and a few in Hindi, drawing on western musical traditions. Within this lot, there were two clearly discernible trends: collective songs, mostly translations and adaptations from the international protest music tradition, but also those inspired by it and, the second, consisting of songs in the harmonic tradition. The history of protest music has also seen a large number of debates about the appropriate form to be used, how the music is to be performed, about whether the focus should be on innovative form or on the content, and so on. Hans Eisler, the German composer and musician who also composed music for many of Bertolt Brecht’s plays, expressed strong views about how music should convey protest. Similarly, the music of Bob Dylan introduced a major break through a very different use of voice, mode of rendering and kinds of lyrics, which generated discussions on Dylan’s style and its appropriateness. In India, the music of the Kerala People’s Arts Club, the KPAC, which was established in 1951 and was in the tradition of the IPTA, consciously crafted a musical tradition where the tunes and the lyrics had a distinct character which attempted to assimilate from as well as break with certain established traditions. This conscious crafting of the music took place as a result of significant deliberations and debates within the movement. In the IPTA’s repertoire, there were several classical based songs that came into existence as a result of the conviction among some of the musician-activists associated with it that protest music should not compromise on quality and should be elaborate and based on the classical tradition. The protest song, in India and elsewhere, reflected varied contexts ranging from the lives of the working class and conditions on the shop floor to international developments. 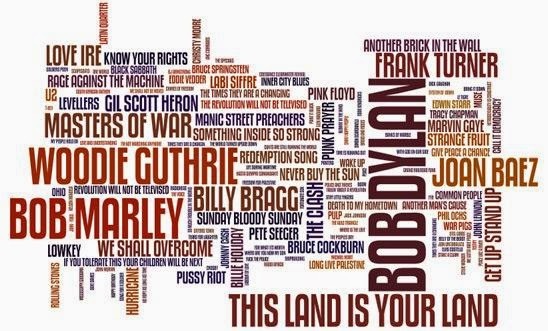 Internationally, the Great Depression, the two World Wars, the Russian Revolution, the Vietnam War and the War against Iraq have been events that have spawned a huge corpus of protest music. In India, the Second World War, the anti-colonial struggle, the Bengal Famine, the Emergency, communal riots over the years and the living conditions of ordinary people have been the subject of innumerable protest songs written over a period of almost seventy years. Sumangala Damodaran is Associate Professor at Ambedkar University Delhi.